The vehicle of the supervisor over Rabbi Yosef Efrati’s “mehadrin” kosher status for vegetables during this Shmittah year was stoned near the Arab-Israeli village of Tira, resulting in the supervisor leaving the area. As the kashrut supervisor left the area for which he was responsible for, Arab minors opened up on him, throwing rocks. Following the incident, the Shmittah Committee announced that the area was no longer under its supervision until further notification. To download the app, go to Google Play. For more iPhone apps for the frugal shopper, click here. Looking for a way to connect to the land during shmitah? Here are some ideas for activities related to shmitah- start planning your next holiday now. Most of us are familiar with this organization that collects fruits and vegetables from farms and leftover food from various events to distribute to the needy. 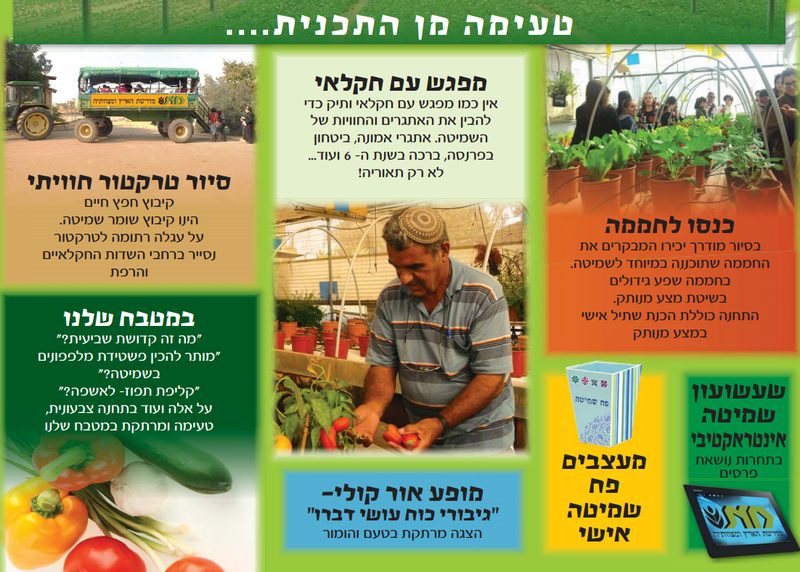 During shmitah, collecting produce will take place in the fields of Moshav Nahalal which is under heter mechira. For more information, call 09-7441757 extension 112, email volunteer@leket.org, or go to their web site. During shmitah, when it is forbidden to plant or to harvest, the people would go out and gather plants and vegetables that grew without human intervention. Yaron Sherman can take you out for a tour to see the bounty that this land has to offer- both in quantity and in quality. The tour includes a theoretical part after which you collect foods to create a meal. The tours are by prearrangement only and take place throughout Israel. They are appropriate for groups of all ages. For more information, call Yaron Sherman at 052-7400587, email halakatim@gmail.com, or go to his Facebook page. During shmitah the Midreshet invites everyone to come to learn, do, and try. The visitors will enter a greenhouse that is an example of how vegetables are raised in a permitted manner during shmitah, will prepare a seedling and meet with a farmer who will tell of how he works during shmitah. You will also be able to go into “Our Kitchen” to learn about the halachot of shmitah, watch a sound and light show, and ride around in a tractor to the refet and other parts of the kibbutz. For more information, call 08-8593870, email Midreshet.hafetz@gmail.com, or go to their web site. The educational center of Kibbutz Hannaton invites youths and students who speak English and Hebrew to learn and work according to the values of Judaism, nature, and peace. The kibbutz offers tours of the different methods used during shmitah in the orchards, hefker fields, and heter mechira fields. You will also have a chance to meet the Arabs working in the fields to understand how the heter mechira fits into the National Zionist ideology. For more information, call 04-9059605, email echanaton@echanaton.org, or go to their web site. KKL offers a wide variety of activities related to shmitah based on ecological, social, and Zionist values. You can choose between shmitah tours in the forests and nurseries of KKL or activities that value the preservation of nature through preserving and treating the KKL forests. The activities are appropriate for students and groups. For more information, call “Kav L’Yaar” at 1800-350-550, go to the KKL web site, or read a previous post of mine. Vertigo is a village of ecological artists in Kibbutz Netiv Halamed Hay. For the shmitah year they offer a way to get closer to the earth through meditation, directed breathing, movement workshops and art. The activities are accompanied with a textual study of shmitah, using it as a foundation for practical exercises. The activities are appropriate for groups of all ages. For more information, call 02-9900235, email village@vertigo.org.il or go to their web site. Mischak Chozer are activities that are based on games made from recycled materials. Some of the games will bring back fond memories from the adults of their childhood. The games are meant to encourage creativity and curiosity for a relatively low price. Dina Eitan-Lior will bring the games and activities to you. Preference is given to communities in the periphery and weaker communities. The activities are intended for preschools, schools, senior citizens, and communities. For more information call Dina at 054-5649554 or email dinalior@gmail.com. Heter mechira is one of the most controversial aspects of shmita. I will try to present all sides of the issue so each of you can form your own opinion. In the 1500s there was a debate between Rabbi Yosef Caro and Rabbi Moses ben Joseph di Trani (ha Mabit) as to whether agricultural products grown in Israel by non-Jews were subject to shmita observance. Rabbi Yosef Caro permitted Jews to eat this produce while ha Mabit did not. This issue was of great importance in that day because there was no Jewish agriculture- the Jews were reliant on Arab produce for their subsistence. Moving ahead to the late 1800s, where the Jewish settlers of the first aliyah movement were producing wine and citrus fruits. The settlements had previously been under threat of collapsing and were saved by Baron de Rothschild. The year 1889 was a shmita year and the settlers were genuinely afraid that they would not survive. They petitioned the Rabbanut at that time to issue a heter- permit- to allow them to work the land but were refused. They then took their campaign worldwide stating that it was a case of pikuach nefesh- saving a life- to which all law is to be put aside. Three rabbis in Eastern Europe- Samuel Mohilever of Bialiystok, IJ Trunk of Kutno, and Z. Klepfish of Warsaw agreed to a heter which permitted the land to be sold to Arabs for two years on the condition that work would be carried out in specific ways. Firstly, if affordable, non-Jewish labour should be used. If the settler was to poor, he/she could work on the land under the supervision of the Rabbanut which would permitted only work that was forbidden under rabbinical law. They also required the approval of the Gaon of Kovno, Rabbi Isaac Elhanan Spector, who agreed. Despite that, there was great controversy amongst prominent rabbis who felt that the Jewish community was not in such dire straits at that time. There were also rabbis who felt that observing shmita was a Torah law and not a Rabbinic law and therefore it is impossible to allow legal loopholes. In 1895 a new version of the heter mechira was presented. It applied only to fruit trees and not the land, which allowed the settlers to still sell their fruit. This did not apply to other agricultural products. It also did not allow performing work on the trees unless it was to save the life of the tree, which is permitted anyway. The Arabs were supposed to cut down the trees, but if they didn’t the contract would be void and the ownership would return to the Jews. This heter was also applied in 1902. The Ridbaz disagreed with Rav Kook and claimed that eating shmita produce as a result of forbidden activities was akin to eating pork. Divine redemption, he said, will only come if we are observing shmita and not looking for excuses not to observe. Rav Kook felt quite strongly that if people saw farmers struggling to survive, it would prevent people from wanting to move to Israel; one of the most important concerns of his time. In 1935, the Chazon Ish published a review of all of the previous discussions regarding shmita and came to the conclusion that there is no halachic basis for the heter mechira. The Chief Rabbinate continues to renew the heter mechira each shmita year. There are fundamental differences between the heter mechira of colonial Israel and the modern state of Israel. In previous times, each farm performed a heter individually. In modern times, the Rabbinate performs a mass sale to one Arab, which leaves doubt as to whether the intention is for it to be a real sale. In addition, we would be hard-pressed to say that observing shmita would cause physical ruin to the Jewish State. Finally, in comparison to the religious Jews of colonial times who petitioned for a heter mechira because they were afraid for their lives, the great majority of farmers in Israel are not Sabbath observant. What is the most acceptable method to deal with non-religious farmers? One cannot neither force them to observe shmita nor forbid their produce from entering the market. Therefore using the heter mechira is considered the best alternative. The most difficult issue with the heter mechira is the visceral reaction most people have to the State of Israel selling its land to an Arab. So many people have died to preserve the State of Israel that it seems criminal to sell it. In addition, the heter is only valid if the sale is intentional and not symbolic, which makes matters even worse. There are people who believe in the validity of the heter mechira based on the opinion of Rav Kook. The Kibbutz HaDati movement is the largest movement that supports the heter mechira in this time. Another group of people who use the heter mechira are farmers who live in areas that are in doubt as to whether they are within the borders of Israel- the south and the Beit Shean area for example. They use it as a safeguard in cause the doubt is incorrect. Charedi farmers do not hold by the heter mechira and observe shmita by leaving their land fallow and hefker (ownerless). They receive subsidies from the Ministry of Agriculture during shmita to prevent them from falling into dire financial straits. Source: Shemittah and Yobel by Dayan Dr. I. Grunfeld. 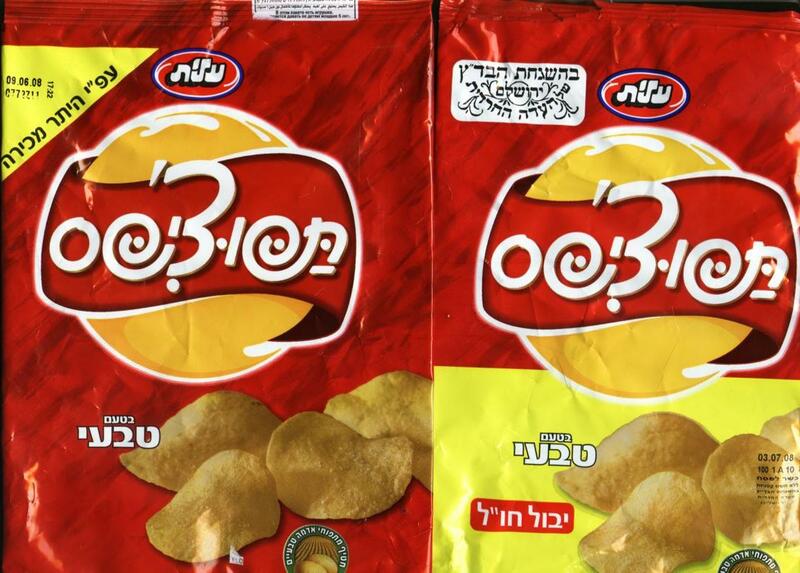 Same chips, different hashgacha and therefore different sources of potatoes.